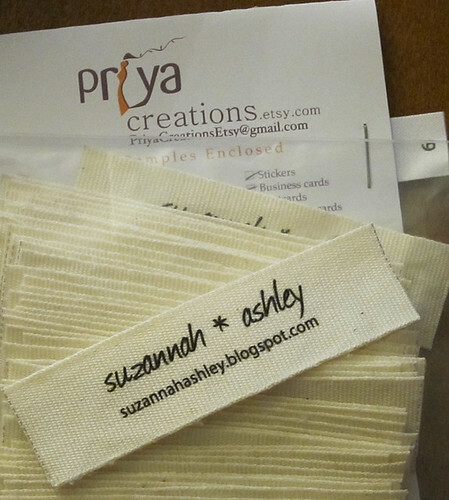 Suzannah Ashley: The labels arrived! My labels arrived today! I'm so excited. They look great, and are so well done. I'm definitely very pleased and can't praise Priya Creations enough for the outstanding job. I definitely recommend them for all label needs. I just made my layout, and uploaded the file to them. I was given a soft proof, and after approval and a few days these lovelies were waiting for me in the mailbox! Now to tackle that craft room so I can get to making some things to sew this little guys on to. I've got lots going on in my head to get done! I wanted to sew one onto Keith, but he didn't think that was a good idea. Harumph!